Looking back to examine some of the issues that helped shape the real estate landscape last year, provides us the opportunity to look ahead at how those trends might affect the industry in 2019. Most evident in 2018 was the added liquidity brought about by the phenomenal growth of debt funds. This increased competition, not just among debt funds, but traditional lenders as well, has resulted in significant spread compression and higher leverage, as much as 85 percent LTV for well located projects with strong sponsorship. This phenomenon, where the gap between long- and short-term rates narrow and leverage creeps up, occurs toward cycle peaks and is a definite sign that we are in the very late innings of the recovery. The other significant trend that has shaped the real estate markets this year is the climate of uncertainty that has impacted the industry both positively and negatively as a result of current administration’s policies. For example, the trade war with China and the institution of tariffs have increased costs for developers, making investment in projects more difficult. This is especially true for developers of single and multifamily projects. Estimates from the National Association of Home Builders claim that homebuilders and those in the home remodeling industry almost exclusively used products from China, the primary target of the new tariff policy. Rising costs on items like steel aluminum and granite slowed or even stalled development in markets around the country as developers had to rethink, in some cases redesign their projects as a result of uncontrollable increases in materials costs. Such volatility makes it very difficult to underwrite much needed housing, making it a point of focus of many lenders and investors today. The temporary truce between the United States and China suggests that hope springs eternal, but the recent volatility in the stock markets indicates that there is still much work to be done before a workable trade pact is finalized between the two countries. While the new policy on tariffs impacted the industry somewhat negatively, the administration’s efforts to increase investment activity in economically distressed communities led to the development of Opportunity Zones, under the Tax Cut and Jobs Act. Opportunity Zones, which encourage investors to reinvest their capital gains in economically distressed communities in exchange for significant tax benefits is now attracting a lot of private capital — with estimates of as much as $100 billion being raised by newly formed Opportunity Zone Funds. According to research from Yardi, there are more than 8,700 areas in all 50 states of the U.S. that were designated Opportunity Zones by the Treasury Department. While offering tremendous opportunities for both residential and commercial development –– the deployment of that capital will take some time. And on the regulatory side, the current administration has been a little steadier. Having chipped away at Dodd-Frank, life has become a bit easier for the small banks, although two months into the year, that has not yet happened in a wholesale way as of yet. It was also in 2018 that the White House and GOP members of Congress favored removing Freddie Mac and Fannie Mae from U.S. conservatorship, where it has been since 2008. While, it is unlikely that Congress will act in 2019 to privatize the GSE’s, the privatization of Freddie and Fannie signal that significant changes are on the horizon. As we continue into 2019, the focus on debt funds and the geo-political roller coaster should continue. Lenders are still being diligent in their underwriting which should continue in a demonstrable way for some time, although we may see some further spread compression, as competition continues to increase with an abundance of capital seeking to finance a finite number of deals, to the benefit of borrowers. It is worth noting that while retail continued to struggle in 2018, investors and lenders are getting to understand the asset class a lot better, giving cause for some optimism this year. We are beginning to see more categorization, a much more precise definition and stratification of both the retailers and the types of retail. That’s helping everyone, including investors, to start to understand what seems to work and what absolutely does not. A 113-bed assisted living and memory care facility in Glendale has received $59.4 million in debt and equity financing, banking firm Dekel Capital announced Jan. 29. The facility, Sage Glendale Senior Living, is being developed by Willis Development. When completed, it will have 81 assisted living units, 24 private memory care units and four semi-private memory care units. East West Bank gave a $38.7 million construction loan. Dekel arranged the loan and provided $20.7 million in equity. Sage Glendale is at 509-525 W. Elk Ave.
A Texas-based industrial real estate developer got a $34.3 million construction loan to finance a speculative logistics facility in Lakeland. Xebec of Dallas plans to build a 537,000-square-foot logistics facility on a 60-acre site along Interstate 4. 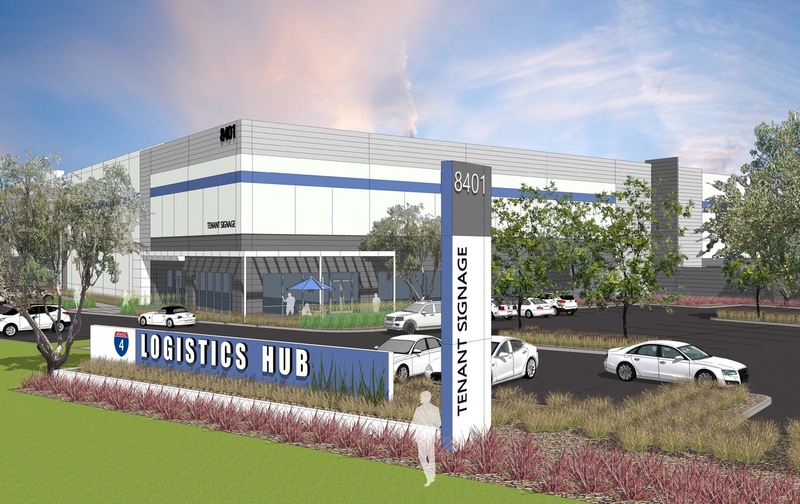 Scheduled for completion in the fourth quarter of 2019, the logistics facility will have 36-foot clear height, 185-foot truck courts, 426 parking spaces for cars and 107 for containers. Dekel Capital arranged the $34.3 million construction loan for Xebec’s speculative development in Lakeland. A pension fund advisor originated the three-year loan with interest-only payments and a loan-to-value ratio of 85 percent. New lenders are continuing to enter the market, especially in the bridge lending space, and the competition will mean good things for borrowers in the fourth quarter and beyond. The fourth quarter will be a borrowers market, thanks to a growing increase of new lending sources. This year, new lenders have routinely entered the market, particularly in the bridge lending space. As a result, lenders are loosening underwriting standards and reducing spreads in order to meet production goals, and this competition has allowed borrowers to dictate terms. This liquidity in the market will fuel activity in the fourth quarter as well as in through 2019. Dekel Capital, a Los Angeles-based real estate merchant bank that specializes in sourcing and placing equity and debt for active middle market commercial real estate developers and investors, has successfully placed $14 million in bridge financing on behalf of Mountain Capital Partners and Willis Development to enable sponsors to retire existing construction financing and enable continued stabilization of Kingston Bay, an assisted living and memory care development located in Fresno, California, announced Dekel Managing Principal Shlomi Ronen. 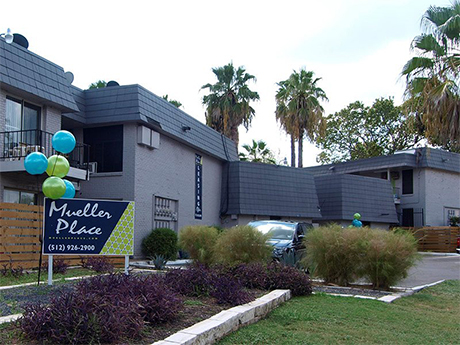 A joint venture between two California-based firms, Dekel Strategic Investors and Arrowroot Real Estate, has purchased Mueller Place, an 86-unit multifamily property in Austin. The new ownership will treat the investment as a value-add opportunity and renovate the unit interiors and property exteriors in an effort to bring rental rates in-line with the submarket. On April 3, with little fanfare, the Fed’s Alternative Reference Rate Committee (ARRC) started publishing the Secured Overnight Financing Rate (SOFR) that is slated to replace LIBOR in the US. This is an important first step in the transition away from LIBOR that is scheduled to expire in 2021. It is estimated that the US financial markets have $200 trillion of debt with LIBOR exposure; of this, approximately $1.1 trillion is commercial real estate (CRE) debt and securitized CRE debt. This pervasiveness requires a complex multi-year transition, but there is uncertainty as to the extent of progress that can be made before 2021. In Multifamily Finance, Fannie and Freddie Are Still the Elephant in the Room. Shlomi Ronen emphasized that Congress and the FHFA ought to implement reforms with deliberation, changes that aren’t well explained clearly in advance could startle the market. Regardless of where the agencies go from here, a survey of multifamily lending players underscored how high the stakes would be for any major reorganization. 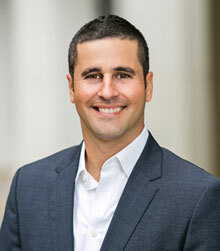 Shlomi Ronen, the founder of a Los Angeles debt brokerage that often arranges agency financings, Dekel Capital, emphasized that Congress and the FHFA ought to implement any reforms with deliberation, forecasting that changes that aren’t well explained clearly in advance could startle the market. Adverse reverberations, in turn, could be cataclysmic in Ronen’s home state, he explained. Sky-high land prices and zoning restraints already make it difficult enough to make the math work on affordable housing projects. Things could get immeasurably direr, he said, if the sector’s go-to financing source disappeared. This article originally appeared on Commercial Observer. Dekel Strategic Investors is trading ground-up multifamily deals, where there may be some softness in rental rate growth, for value-add and core-plus strategies. Dekel Strategic Investors, a division of Dekel Capital, is shifting its multifamily equity capital strategy to focus on value-add and core-plus deals. The firm is moving away from ground-up development, which it says no longer offers an attractive risk-reward profile. The new strategy will continue to make small balance equity investments ranging in size from $5 million to $15 million using 65% leverage. We sat down with Shlomi Ronen, managing principal at Dekel Capital to talk about the strategic shift and what he is looking for in a deal. Read the rest of the story on Globe St.
Two short months into 2018 we have seen a significant uptick in treasury yields along with positive economic data supporting continued Fed rate hikes for the remainder of the year. In the CRE lending universe however, the focus has been on has been on increased competition and decreasing credit spreads. Here we will briefly touch on a couple of catalysts for this credit spread compression, as well, highlight a few lending programs that are relevant for our developer and value-add investor clients. The peer group of bridge lenders focused on transitional projects continues to expand – by our count there are over 90 well-funded capital providers. This is a trend that we identified last year. This opportunity for bridge lenders has been fueled by banks shifting their focus and capital to financing facilities for these real estate debt funds, as well as buying A-Notes on loans originated by these bridge funds. Additionally, the muted CMBS origination volume has incentivized traditional CMBS shops to raise and deploy bridge capital as a tool to lead-sourcing tool for fixed rate lending. Bridge lenders across the board have trimmed their spreads as much as a 100 basis points since Q4 – a clear reflection of the increased competition, lender financing options, as well as capital available at all leverage attaching points. Further tailwinds for this lending has come from the CLO market re-activating in 2017. $109 billion of CLOs were issued in 2017 compared to $76 billion in 2016. DEFINITION: A collateralized loan obligation is an asset-backed security which is backed by the receivables due on loans. Lenders package and sell their receivables on loans to investors in order to reduce the risk coming from potential loan defaults. Returns on CLOs are paid in tranches; that is, the individual loans backing a CLO have different maturities, and investors are paid out as each matures. Lenders offer higher interest rates to investors willing to buy CLOs backed by higher-risk loans (Farlex Financial Dictionary). As well, the private REIT market has further buoyed the space, with a number of lenders forming private REITS to source cheap capital. While Libor and Treasury rates have gone up, lenders have compressed their spreads – keeping investors and borrowers focused on the all-in coupon. Lender return expectations have not gone up in conjunction with the rise in the indices (which is typical in a rising interest rate environment). We would attribute this to overall stability in the economy and the lack of higher yielding savings and or investment opportunities. A leading credit-focused alternative asset management firm is offering up to 80% LTC bridge- financing on multifamily value-add projects, pricing starting at L+325. They can layer on additional mezzanine financing up to 90% LTC, priced at 12% with some upside participation. Nationwide. One established fund manager has received a new allocation to deploy low-priced floating rate debt priced at L + 2.75% and up, at 70% to LTV. Up to 7-years of term, with a focus on taking out construction loans on new multifamily developments, or lease roll plays on office properties. Loan sizing at $20M+. Life Co will take on “hairier” deals. They are comfortable going to 65% LTV and can offer shorter term 5-year fixed bridge money, $10M minimum check size. Open to look at properties with less than break-even cash flows. Pricing is typically at applicable Treasury + spread of 160 to 180. 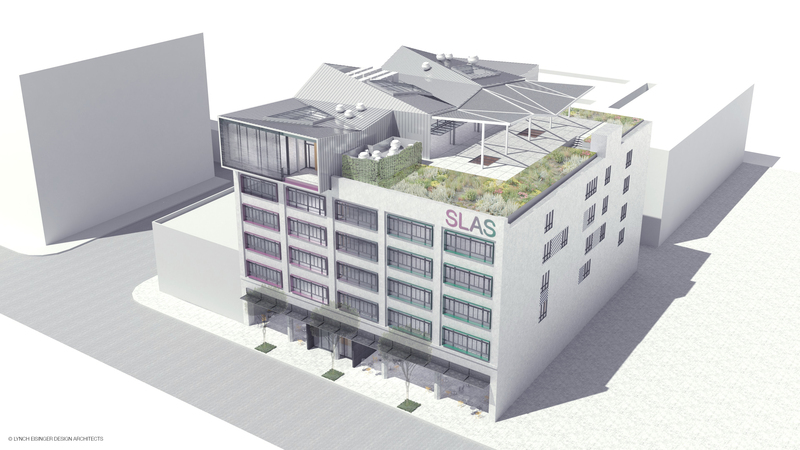 January 16, 2018 Dekel Capital co-brokers $122m equity-and-debt package for the development of Class-A creative campus in Downtown Los Angeles. 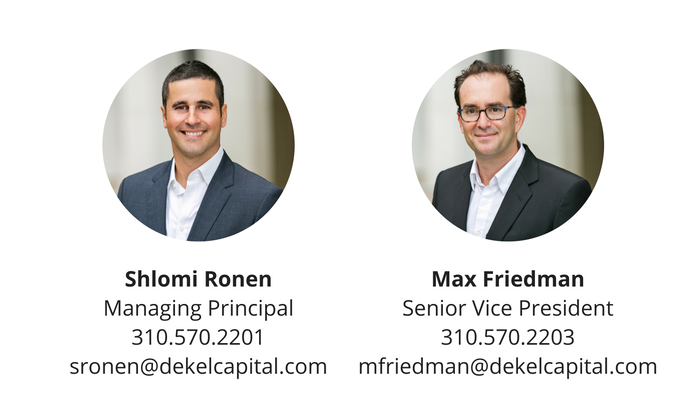 Dekel Capital co-brokers $122 million in JV-Equity and non-recourse Bridge Financing for sponsors Urban Offerings and ESI Ventures. Proceeds will be used to develop a 250,000 square foot Class-A Creative Office Campus in downtown Los Angeles’s Fashion District. Dekel Capital Founder & Principal Shlomi Ronen contemplates the top trends that impacted the capital markets this year, and discusses how the major capital sources and real estate sectors performed. As the year comes to a close, we reflect on the major trends in the real estate capital markets and their impact on operating, investing and new development activity nationwide. The capital markets continue to push forward with a full head of steam through year-end. Today there is ample liquidity and reliable competition among lenders at all levels of the capital stack. Geo-political concerns that dominated the first quarter of the year have abated, as the national economy continued to expand at a steady, manageable pace. As a result, this year we saw lenders enter new markets, expand their platforms to lend on niche product types, and take on more execution risk in order to maintain pricing and constrain LTV/LTC ratios. On the institutional equity side, 2017 proved to be a challenging year to deploy capital, as liquidity compressed yields across the risk spectrum, new supply (especially in multifamily) tapered rent growth in most major markets, and concern over the longevity of the real estate cycle tapered equity investor appetite for investments that were exposed to significant market risks beyond two years from the initial investment date. On the international front, we saw the Chinese government curtail outflow of capital from China, which resulted in a palatable contraction of new Chinese equity capital in the market. On the other hand, we saw Japanese investors expanding their U.S. investment focus in a significant way. Construction Lending: New banks sparingly entered the constructing lending market in 2017. The few that did created lending programs that took advantage of the pricing gap between their bank peer group and the pricey, non-recourse, debt fund construction loan options. In general, construction financing in 2017 seemed to find a comfortable equilibrium between demand from the development community and supply from bank and non-bank lending sources. Multifamily: Competition among lenders on stabilized apartments (or new projects in lease-up) continues to be ferocious—with loan proposals sized and priced to perfection in coastal locations. Borrowers are being fully enabled on their refinances, as underwriting standards reflect current valuations, despite the expectation that interest rates will move. Additionally, mobile home communities seem to be in favor with lenders nationally. The expectation is that the agencies will continue to provide strong tailwinds, with 2018 multifamily lending caps for Fannie Mae and Freddie Mac projected to be at $35 billion for each enterprise, just slightly down from $36.5 billion in 2017. Agencies (and some banks offering fixed-rate programs) are proposing increasingly attractive terms, in contrast to conduit lenders (further discussed below) who are restrained due to risk retention and consistent discipline from the CMBS B-piece buyers. Office / Industrial: Industrial properties and creative offices have grown as a result of technological disruption, fundamental change in consumer habits, as well as the desire to attract and retain millennial talent. Institutional equity funds continue to express a strong appetite for both value-add and ground-up development opportunities in the industrial sector. Generally, industrial is wholly accepted and recognized as a critical component of a commercial real estate portfolio allocation. Equity investors and lenders understand the need to be involved on speculative, ground-up industrial deals in order to win business, as demand drivers show the strength of the containerized supply chain going forward. The appetite for creative office remains strong, although with time horizon constraints due to the expectation of economic slowdown at some point in the next two to three years, investors in value-add projects are leaning heavily toward business plans that can be executed within 24 months. Longer business plans are being hyper-analyzed due to the expectation of a general slowdown in the economy thereafter. Retail: Today, retail is all about buzzwords: “right sizing the retail experience,” “experiential,” and “omni-channel” concepts are popping up in our conversations with sponsors. The retail space is evolving, sparking curiosity in equity investors and caution from lenders. We are seeing valuations shift to indicate that equity can mitigate the sector risk in retail with smaller bets in this space. Meanwhile, the commoditized grocery or big-box, anchored business plans based on population density and demographics are considered non-starters for most equity investors unless there is a compelling story (or basis). Land: Lending on land is all about location. In-fill sites are receiving multiple bids from lenders for pre-development bridge loans that range from 12 to 24 months. Lenders are most aggressive on residential for-sale and multifamily sites. CMBS: Updated risk-retention regulations have created higher barriers to entry, with minimal movement in who the main players are in the CMBS peer group. Pricing has remained steady in the past year, providing lenders with some respite after market fluctuations around year-end last year left some borrowers with rates above their original quotes. Going forward, our sense is that it is a game of scale—larger players are taking more market share. A few new, non-securitized lenders have entered the fixed-rate space, looking to pick off the small dollar loan requests by offering fixed transaction costs and in-house servicing. Overall, our recent conversations with players in the equity, debt and brokerage space have a familiar theme: everyone seems to have had a busy and productive year and is looking to take a few weeks off at year end to recharge for a competitive year ahead in 2018. This article was originally published on Commercial Property Executive. CHARLESTON/ LOS ANGELES, October 16, 2017. Dekel Capital recently closed a $17 million non recourse construction loan for Xebec Realty Partners.. Proceeds will be used to develop a 262,080 SF state of the art Class A multi-tenant light industrial facility in North Charleston, South Carolina. Dekel Capital utilized its extensive network to identify a lender that was capable of understanding the property’s unique positioning and attractive location, and could provide competitive loan terms. “The development will bring much-needed Class A supply to North Charleston’s booming economy where recent transactions indicate significant growth and gave Dekel Capital and the lender a high level of confidence that this was a good investment.” said Shlomi Ronen. The site is strategically located as the last developable site in the Palmetto Commerce Park, which features a variety of tenants including Boeing and Mercedes Benz. The site has excellent access to U.S. Interstate 26, the primary route of transit inland from the Port of Charleston and Charleston International Airport. This deal reflects Dekel Capital’s ability to source capital for its developer clients as they expand into new markets. This non-recourse construction financing was structured as a “stretch senior” loan, which allowed for increased loan proceeds at attractive pricing. The firm has been engaged in a combined $2 billion of structured transactions for developers, operators and investors, over the past 15 years. September 28, 2017 RE Capital Markets Insights: It’s Competitive Out There…. Dekel Capital was in attendance at the Western States CREF Conference a few weeks ago, where, over the span of two days, we met with over fifteen lenders and funds (and enjoyed a few nice meals, as well). The majority of the meetings were with institutional debt funds and banks active in the bridge lending space. The phrase “it’s competitive out there” came up in most of our conversations. New lenders continue to enter the bridge lending market – filling the gap as banks continue to pump the brakes on lending (despite economic drivers and data continuing to show positive trending through the end of the year). Interestingly, the increase in competition is consistent across loan size profiles – with players entering in the sub-$10M loan size space, up through mid-market and larger loans. One quick takeaway is that lenders are differentiating themselves via pricing and structure – as opposed to purely pushing leverage on senior loans, which was pervasive in the past. We noticed a clear distinction between bridge lenders focused on lighter value-add deals with in-place cash flow versus lenders that were more comfortable with heavier construction execution and lease-up risk. Ground-up construction is firmly within the sights of the larger debt funds, which are looking for $25M+ loan requests and offering a non-recourse option to developers. The “stretch-senior” bridge and construction loan product is one place the lenders are working to differentiate themselves – moving from traditional leverage of 65% up to 85% – 90% of cost by layering in an internal mezzanine debt piece. When borrowers are willing to take bank recourse loans, they are capturing around a 100-basis-point discount to debt fund pricing, as well as benefiting from lower transaction costs. We believe the gap between fixed and floating rate loans will continue to compress as rate indexes such as LIBOR, Treasury and Swaps finally start to inch upward. Lastly, as a whole, there was not the sense that everyone was avoiding discussion of potential elephants in the room – underwriting standards appear to be holding, and lenders are exhibiting a healthy level of caution for deals outside of primary or secondary markets. Dekel Capital Managing Director Shlomi Ronen discusses 2017 mid-year trends in real estate financing, including borrowers’ increased demand for alternative lenders keeping the balance between demand and new regulations. As the first half of the year has come to a close, we look at trends in real estate financing, influencing commercial real estate investment and development. As a result of the Dodd Frank risk retention rules that were implemented at the end of last year, the number of CMBS lenders has contracted significantly and the impact on the market has been muted due to lackluster borrower demand for CMBS loans. According to Trepp, only 21 lenders have participated in securitizations this year and the five top lenders accounted for more than 61 percent of the volume. That is a significant drop from 2015, when 38 lenders contributed loans and the top five accounted for 43 percent of the volume. The large banks with balance sheet capacity have emerged as the beneficiaries of the new regulation as a result, because they can retain a risk piece. Irrespective of this change, borrowers continue to demand CMBS alternative financing, as the CMBS loan origination process continues to be costly with loan terms subject to changes in the bond securitization market. In addition, loan servicers have been slow to document loan assumptions on asset sales, further frustrating borrowers. In the first half of this year we saw a few financing companies roll out fixed-rate loan programs designed to specifically target these issues. By either using their balance sheet or deferring securitization, these “CMBS alternative” lenders are offering a front spread lock on loans and will retain servicing for the life of the loan. The agencies continue to be the go-to source for multifamily financing. With significant deliveries of Class A properties, we have seen the agencies become more selective and conservative in their underwriting on their “lease-up” programs. In some cases, they are pulling the lease-up program all together over supply concerns. Otherwise, they are aggressively providing both fixed rate and floating rate loans for stabilized properties. Debt funds have been dominating the non-recourse bridge loan space this year. New capital raised last year has translated into increased competition that has both brought down the cost of bridge debt and loosened underwriting guidelines. In order to differentiate their capital and “win” new business, we are seeing a willingness by the debt funds to take on more construction risk, push leverage, and lend in secondary and tertiary markets; Oftentimes leverage is being increased through the use of internal mezzanine. Additionally, we are seeing for the first time bridge lenders willing to commit to future funding without charging interest on the hold back amounts. Construction lending capacity at the banks seems to be better managed this year as a result of tightened underwriting parameters, loan rationing and consequential filtering out of sponsors. We are seeing the upper limit on loan to cost at 70 percent, with most banks maxing out leverage at 65 percent. The rule of thumb for sponsorship liquidity and net worth requirements used to be 10 percent of the loan amount, with the net worth being equal to the size of the loan. However, as developers take on more construction projects, banks are shifting toward 15 percent liquidity upwards of a 150 percent net worth. Credit spreads on construction loans, however, have flattened–we have not noticed any significant changes in spreads so far this year. With respect to land financing, some banks are willing to provide pre-development or land development loans, but sponsors are being underwritten to take out construction financing, and only in cases where lenders are also actively trying to win the construction loan. Product type comparisons show that street-level retail centers with legacy tenants, as well as mid-size and big box centers, are the lowest priority for bank lenders. Industrial properties are in high demand, especially in infill locations in major markets where last mile industrial properties are undersupplied. Due to constraints on bank construction debt leverage, mezzanine and preferred equity funds have proliferated in the middle-market commercial real estate space, providing up to 85 percent financing on development and value-add deals. Various funds are offering a stretch senior product in which they provide the full capitalization, with the senior loan component priced competitively with bank financing and removing one additional capital partner from the equation. These funds are typically non-recourse, which is more appealing to borrowers as they are focused on balance sheet management, given the banks increased focus on contingent liabilities. This year we have seen JV equity funds shift their focus back to major markets as opposed to searching for higher-yielding investments in secondary or tertiary markets. Funds remain focused on partnering with experienced sponsors, especially as execution risk from a market cycle standpoint has become a greater point focus for them. The capital markets continue to evolve with seemingly strong liquidity in all segments of the market. Recently proposed changes to banking regulation and pending rate hikes should not materially change the supply of capital in 2017. Dekel Capital actively sources equity for developers in the industrial, creative office, multi-family space. We advise our clients to get out in front of their deals in terms of timing as the groups that are active are busy, which can affect closing timelines. This article was originally published in the CPE newsletter 7-19-17. We are looking for a diligent, communicative and detailed individual with a desire to take his/her commercial real estate finance knowledge to the next level. This is a great entry level opportunity to join a growing boutique real estate merchant banking company with both a private equity and capital advisory platforms with a unique culture and a supportive atmosphere. Ideal candidate is a self motivated team player with a serious desire to work in the commercial real estate finance and/or private equity industry. You must be professional, highly organized, detailed-oriented, and able to handle multiple tasks in a fast paced environment and have a can-do attitude. This individual must possess excellent analytical, written, and verbal communication skills, and ability to prioritize. Interact with clients, lenders and investors. CA Real Estate salesperson license is preferred and will be required; option to obtain after hire is possible. Compensation: Competitive compensation offered with a bonus component. About Us: Dekel Capital, Inc. is a real estate merchant banking firm headquartered in Los Angeles. 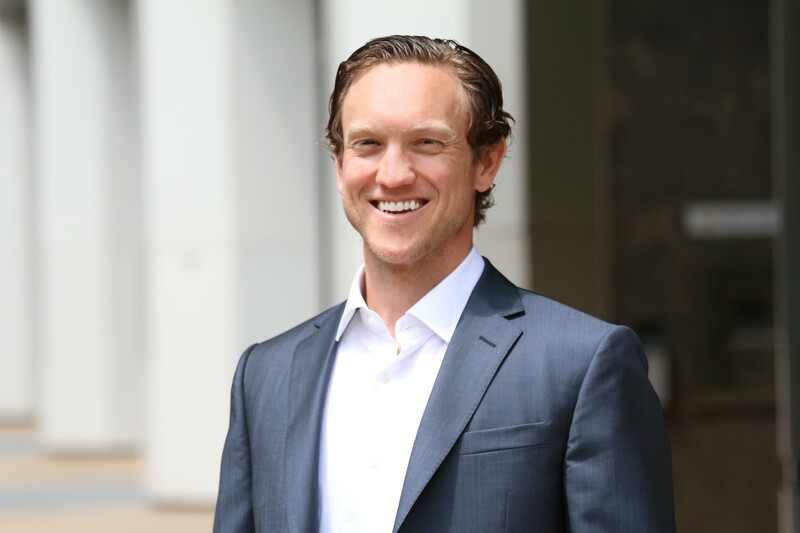 The Company specializes in capital advisory for all asset type throughout the United States as well has a private equity platform that invests in multifamily development projects. This is a unique entry level position to work in both real estate private equity and capital advisory. The Dekel team will be attending next week’s Crittenden National Real Estate Conference in The Westin, South Coast Plaza in Costa Mesa, California on April 27. Dekel Capital is actively sourcing both equity and debt capital for experienced investors targeting opportunistic, value-add and core plus deals. We would welcome an opportunity to meet and discuss your investment focus for 2017. We are attending several commercial real estate events in the upcoming months. Please reach out to a member of our management team to set up a meeting during the events listed below. Crittenden National Real Estate Conference, this three day event brings together Real Estate professionals and offers educational sessions as well as networking events. ULI Spring Meeting, an exclusive, ULI members-only event bringing together top decision makers and industry experts from every sector of real estate. CREFC Commercial Real Estate Finance Summit, networking events and finance sessions presented by leading industry participants. PCBC, dedicated to advancing the art, science and business of housing, PCBC is the largest homebuilding tradeshow representing the west coast region. CMBA, 20th Annual Western States CREF Conference. Among all the market updates and meetings at the Mortgage Bankers Association Conference last month, the one revealing note was that a handful of New York-based bridge debt funds will be opening up offices on the west coast, specifically in Los Angeles. These debt funds continue to see opportunities to gain market share in a growing niche, as bank financing for the acquisition and recapitalization of transitional assets continues to be curtailed in the face of cumbersome regulatory frameworks. Beyond expanding their footprint, the bridge debt fund peer group is also enlarging the strike zone – taking on smaller deals, reemerging aggressively as an option for properties with little in-place cash flow, and looking at smaller markets – a change from the sense in the market as recent as six months ago. With the increased competition in the lender peer group, our clients are benefiting from tighter spreads and lower fees, specific to west coast deals where having boots on the ground allows lenders to fully understand the story and its risk mitigants. Firstly, banks are playing a significant role, as more banks focus their lending capacity (away from construction lending) to providing increased leverage and relaxed terms to the debt funds – expanding the amount of lending capacity of these debt funds who are typically capitalized via committed funds or allocations for hedge funds. Secondly, the securitization market for floating rate debt has returned (CLOs) and offers additional access point for debt funds to recycle capital. Lastly, as a mitigant to lower origination volume expected in 2017 as a result of the volatility experienced in 2016 and the new risk retention rules that came into effect recently more CMBS lenders are offering floating rate, short-term debt products as a lead-source for fixed rate CMBS execution. Dekel Strategic Investors, a division of Dekel Capital, has hit $100 million in equity financing, a major milestone for the firm, which has focused on joint venture equity for multifamily deals. The firm launched its equity program three years ago and strategically focused on joint venture deals and multifamily properties. Dekel Strategic Investors, a division of Dekel Capital focused on development of multifamily and senior housing has invested over $100 million in equity. For inquiries contact Shlomi Ronen, Managing Partner. We are attending the Mortgage Bankers Association CREF / Multifamily Conference February 20th and 21st in San Diego. We would welcome an opportunity to meet and discuss your capital strategies for 2017. Find out more about our recent multifamily transactions and other deals by visiting our news section. Marks the 3rd investment in Senior Housing by Dekel Strategic Investors. LOS ANGELES/TUCSON, Calif.—Jan. 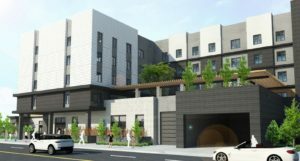 10, 2017— Dekel Capital, a Los Angeles-based real estate merchant bank that specializes in sourcing and placing equity and debt for active middle market commercial real estate developers and investors, has placed $25 million in financing for the construction and development of Sage Tucson, an assisted living and memory care development located in the Northwest Tucson Casas Adobes submarket. The deal was capitalized with a $17 million construction loan arranged through Dekel Capital’s advisory practice and $8.4 million JV-Equity funded by the firm’s proprietary equity fund, Dekel Strategic Investors (DSI). Construction on the 106-unit, Class A senior housing development, located at W Orange Grove Road and broke ground in late 2016, construction to last 18 months. 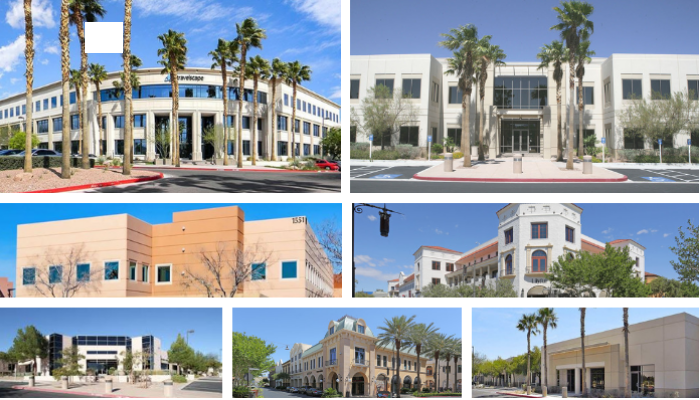 “Sage Tucson presents a first-rate opportunity for investment due to the exceptionally strong rental market in Tucson, the superior location and the remarkable demographics.” Said Shlomi Ronen, managing principal and founder of Dekel Capital. 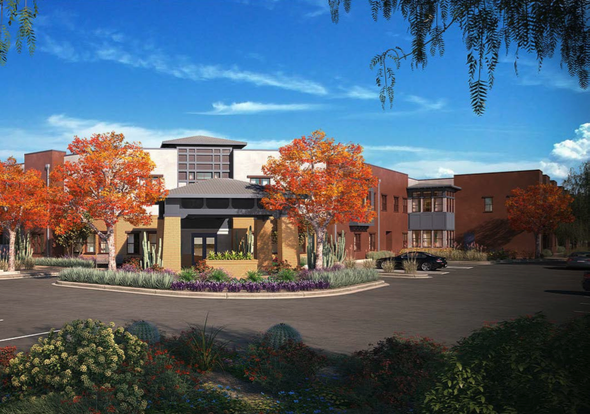 The Sage Tucson assisted living and memory care facility will contain a total of 106 units consisting of 86 assisted living units and 20 memory care units. The project will feature a 2-story structure with a fitness center, community room, craft room, beauty salon, recreational lounge, theater, therapy room and outdoor courtyards on a 9.55-acre site. Sage Tucson has street frontage on West Orange Grove Road, which is an east/west artery that connects to the I-10 Freeway and State Route 77 and has a daily visibility of 23,000 cars. The facility is also located within two blocks of the Northwest Medical Center and in close proximity to the Foothills Mall, located 2 miles from the property, which includes a roster of national rental tenants. Sage Tucson was DSI’s 3rd JV-equity investment with development partner, Willis Development, and their first senior housing investment in Arizona. 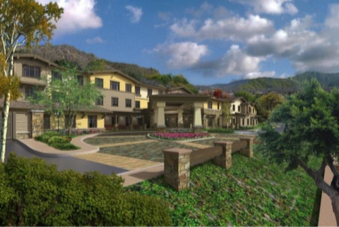 DSI and Willis Development previously partners on two senior housing developments in California: Kingston Bay in Fresno, which is currently in lease up, and Sage Mountain in Thousand Oaks which broke ground Mid-2016. 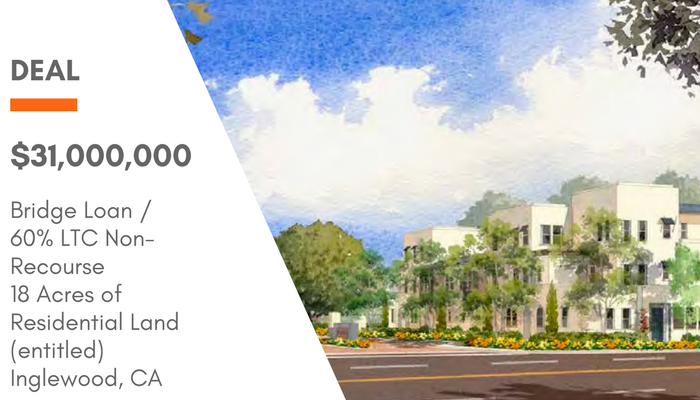 DSI, a division of Dekel Capital, provides equity capital to real estate developers engaging in multifamily, senior housing, student housing and retail development projects. To date, DSI has invested over $100M across 11 deals and is actively looking for more investment opportunities. Willis Development was founded by Wayne Naphtal with the intent to develop senior living properties. Mr. Naphtal has over thirty years of accomplished real estate development experience from acquisition to project disposition. Prior to forming Willis Development, Mr. Naphtal founded First Family Homes and led the full cycle of development from entitlement to disposition for multi-family residential properties in excess of $500 million. 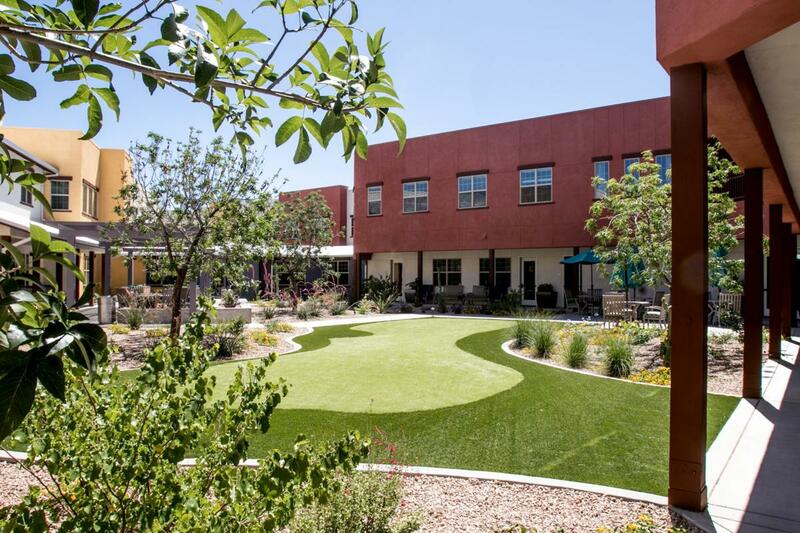 In addition to Sage Tucson, Mr. Naphtal has recently completed a 120 bed Assisted Living + Memory Care facility in Fresno, CA and is under construction on a 130 bed Assisted Living + Memory Care facility in Thousand Oaks, CA. Next year, the final round of CMBS debt from the last cycle will mature. In total, it is about $86 billion in CMBS debt that will need to be refinanced, and according to Shlomi Ronen, principal and founder of Dekel Capital, that is great news for the capital markets because it will create “forced transaction volume,” and will create a lot of opportunities. To find out more, we sat down with Ronen from an exclusive interview to talk about the state of the CMBS market, what to expect next year and if the push for early refinance for CMBS borrowers has helped to ease the burden. Read more on GlobeSt.com in this exclusive interview with Kelsi Borland. 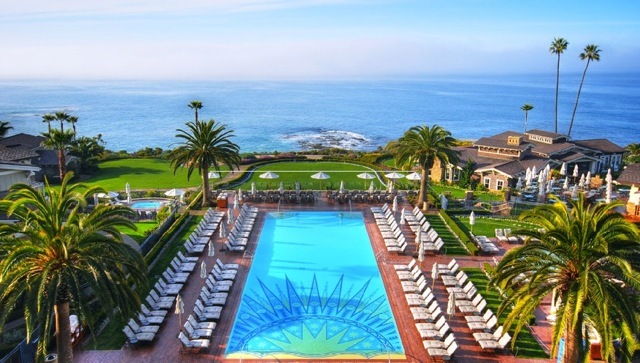 Dekel Capital will be attending the 14th installment of the Annual Winter Forum on Real Estate Opportunity & Private Fund Investing, January 18-20, 2017, The Montage Resort & Spa, Laguna Beach, CA. Last year, Dekel Strategic Investors, a division of Dekel Capital, invested $30 million in JV-Equity across three projects. We would welcome an opportunity to discuss your equity needs for your next multifamily or senior housing project. 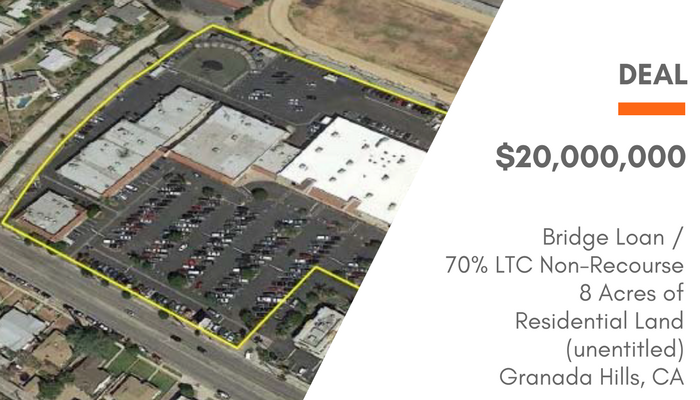 Dekel Capital has successfully placed $20 million in bridge financing for the acquisition of an obsolete retail center in Granada Hills, CA (the “Property”). The 8+ acre site is situated in a desirable location for a mixed-use development in the San Fernando Valley. The existing retail center is currently 79% occupied, lacks a conventional anchor tenant and has considerable deferred maintenance. As a result the Property was not suitable for traditional bank financing. Dekel Capital structured a $20 million, 12-month, non-recourse bridge loan with Buchanan Street Partners that will allow the sponsor to redevelop or reposition the existing retail center. 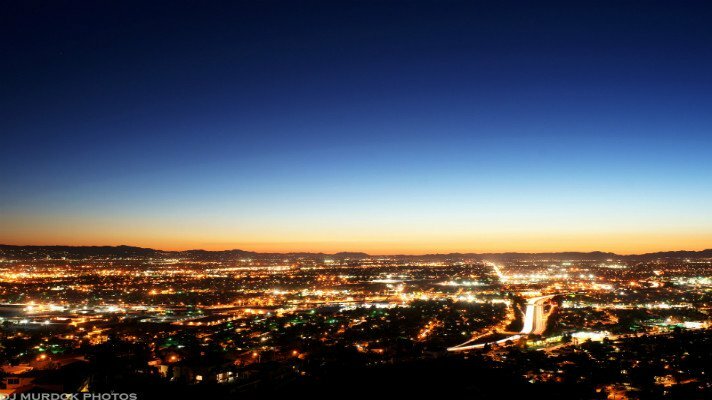 The San Fernando Valley submarket is one of the tightest multifamily markets in Greater Los Angeles area, presenting a prime opportunity for redevelopment within a supply constrained submarket, said Shlomi Ronen, managing principal and founder of Dekel Capital. For additional information please get in touch with Barbara Barnes – Gravesteijn, our media contact. Dekel Capital has secured $ 6.9 million of joint venture equity financing for Haven Realty Capital (“Haven”) to acquire and reposition La Ventana Apartments in northwest Las Vegas.The project’s financing structure includes $6.9 million in Dekel Capital-sourced JV equity, a floating rate senior loan from Freddie Mac and sponsor equity. 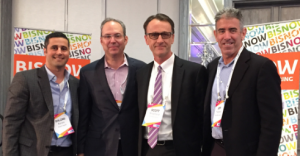 “Through a number of introductory meetings led by Dekel, Haven became a known entity to key institutional equity groups in the multifamily sector,” said Shlomi Ronen, founder and managing principal of Dekel Capital. Dekel started introductory meetings with a number of equity partners and Haven early in the process which showcased Haven’s experience and interest in acquiring assets in California, Nevada and Arizona. These meetings allowed equity groups the opportunity to better understand Haven’s business plan when the La Ventana project was presented. Located at 2901 N. Rainbow Blvd. in North Las Vegas, the 256-unit La Ventana Apartments complex is set to undergo an extensive value-add renovation to meet the demand of a growing professional tenant profile in the immediate area. Haven expects to complete the renovation and stabilize the property over 36 months. “With its thriving entertainment and hospitality-based economy, in addition to recent developments in its technology and healthcare sectors, Las Vegas is becoming one of the nation’s most desirable and affordable metropolitan areas,” said Sudha Reddy, co-founder and managing principal of Haven Realty Capital. 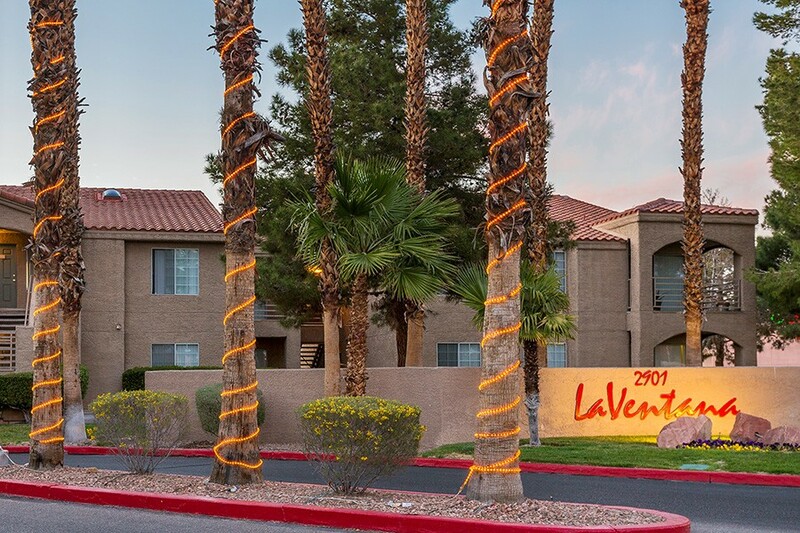 The La Ventana Apartments acquisition marks Haven Realty’s third multifamily acquisition in Las Vegas over the past 12 months. The sponsor also operates a portfolio of 600 single-family rentals in Las Vegas and an additional 1400 single family homes in CA and IL. La Ventana Apartments is in close proximity to the newly expanded Mountain View Hospital, four retail shopping centers and has exposure to strong traffic counts of 20,500 vehicles daily. The property, built in 1989, incorporates one- and two-bedroom units in 17 separate standing buildings on 13.5 acres. With 401 parking spaces, La Ventana Apartments features on-site amenities including in-unit washers and dryers, built-in kitchen appliances and a semi-private entrance in addition to private balconies and patios. The two-story complex also offers a swimming pool and spa, fitness center and children’s playground. Dekel Capital was in attendance at the Western States CREF Conference in Las Vegas earlier this month, where we met with capital sources across the lending spectrum to get updated insights on lending programs and trends in today’s capital markets. The current sentiment is that lenders have recovered from the general market turbulence that reverberated through the industry in the first quarter of the year. Both bridge lenders and fixed rate lenders are now providing fluid supply of debt to meet borrowers’ needs through the end of 2016, albeit at tighter leverage levels than 12 months prior and with a greater focus on in-place cash flow or pre-leasing. The evolving gap in the market for bank lender construction financing (as bank lenders have met allocation levels and are reserving capacity for existing clients) has allowed private debt funds to partially fill this void and become more active players in the space. These traditionally “bridge” lenders aim to differentiate themselves by providing flexible construction loan structures and providing asset management and loan servicing in-house – offering some respite for borrowers who are more accustomed to bank pricing for construction financing. Additionally, given the pullback in leverage by bank construction lenders, construction mezzanine debt and preferred equity investments are being offered by private funds with leverage up to 85% LTC achievable for commercial real estate, and potentially higher for multifamily projects. In some cases, lenders are offering a combined senior + mezz “stretch senior” structure that offers a single capital source for borrowers with larger, heavy value-add and construction projects (20M+). CMBS lenders have seen recent deals priced wider in the face of the regulatory changes pending. Recent AAA securitizations have priced from 102-108 and BBBs have ranged from 525-625. Given the trending among borrowers to lock in rates on longer-term financing, new fixed rate debt mezzanine players are also entering the market, offering longer-term products to complement CMBS (as well as life company and bank loans). The Federal Reserve announced on Wednesday it will not raise its benchmark interest rates and expects to raise rates more slowly in the coming years. The Fed has decided to stick with its cautious approach to adjusting monetary policy, as recent economic indicators have continued to be mixed. With only 38,000 jobs added in May, job growth has declined, yet economic growth has shown signs of improvement. As such, 15 of 17 policymakers project no more than two rate hikes this year, and six of those officials expect just one rate hike for the remainder of 2016. The Fed will meet again in July and September. Global economic uncertainty and the recent Fed announcement have promoted a flight to safety that has caused the 10-year treasury yield to close at 1.594 percent, its lowest closing level since December 2012. The negative yielding bonds from Asia and Europe have also played a part, as these investors continue to purchase U.S. Treasury Bonds and, in turn, drive yields lower. New banking regulations that are coming into effect are restraining construction lending and the delivery of supply. In turn, these restrictions, combined with increasing demand for multifamily housing, are further impacting housing affordability issues prevalent in core urban markets. In a time when home ownership is at already historic lows, people are increasingly relying on multifamily rentals for housing. With this evolving development, existing project owners are benefiting, while renters and developers are being heavily burdened. In the first quarter of 2016, non-seasonally-adjusted U.S. home ownership rates dropped to 63.5 percent both on a quarterly and yearly basis, down from 63.8 percent at the end of 2015 and 63.7 percent in the first quarter of 2016, according to St. Louis Fed data and generally falling in line with the U.S. Census estimate. Currently, home ownership rates are at their lowest since 1967, with similar rates last seen in 1985. The current sustainable dynamics indicate a faltering market, reflecting the overall weakness in economic growth and inefficiency of monetary policy. Amidst declining home ownership, the multifamily segment of the market looks relatively bright and fundamentals remain relatively strong. The National Association of Home Builders’ Multifamily Production Index (MPI) shows a reading of 58 in the first quarter of 2016 compared to a reading of 59 in 2015, still above the long-term average of 49 since the index was started in 2003. The MPI is a weighted average of current production indexes for low-rent, market-rent and for-sale units, and can vary from 0 to 100, where any number over 50 indicates more builders report stronger rather than weaker conditions. In May, REIS reported the nationwide occupancy rate was 96 percent in April, down 10 basis points from March, but flat with the first quarter average. In an effort to make banking safer after the 2008 market crash, we are now seeing the effects of financial rules taking shape, specifically in the form of the Basel III banking regulations and HVCRE rules, which went into effect at the beginning of 2015. As mentioned in our April article, banks have become increasingly concerned with their risk exposure to CRE loans, in particular construction loans, and are tightening their underwriting standards. In certain cases, they are reserving capacity solely for long-standing relationships. Their balance sheets are even more constrained, further limiting the amount of money going into new development deals, impacting availability and pricing, as they become more conservative in terms of leverage and, in some cases, ask for partial recourse. While these regulations work to make banking a safer practice as a whole, they are making it more difficult for developers to obtain the financing necessary to move forward with development projects and deliver supply amidst declining vacancy rates, rising rents and pent-up demand. Many core urban markets already face significant supply constraints in the form of a lack of developable land and community opposition. These constraints have a tendency to increase as new projects consume land and developers build resistance. Market participants can now expect the added burden of banking regulation to result in the slowing of multi-housing construction and exacerbating of affordability problems. Certainly, financial regulators and the rules they enforce are intended to look out for the safety of depositors and their funds. The institutions they regulate are regional, national and international in nature and not designed to respond to local market conditions. However, there are ways to recognize local conditions. For example, Fannie Mae and Freddie Mac determine conforming home mortgage size limits based on zip code, signaling a willingness and capacity to accommodate for local conditions. While the housing shortage and affordability component is widely seen as a burden, it directly benefits owners and developers who are ahead of the game. Those who own rental housing or already have projects under construction have less future supply competition to worry about. As the supply of affordable housing is outpaced by demand, more would-be home buyers are turning to rentals, allowing landlords to raise rents accordingly. Additionally, developers who already have loan commitments or projects under construction have a distinct advantage and can capitalize on the shortage, with higher rents and ease of lease-up due to lack of new product. Developers seeking financing for projects in their pipeline are now having to expand beyond their known lending sources, find other banks and consider alternative financing in the form of debt funds. With tighter construction lending conditions becoming the new reality, we are seeing higher borrowing costs, which are passed on to the end-consumer in the form of higher rents and greater delays in bringing new product to market. Additionally, developers might not meet anticipated project returns due to higher costs of borrowing and may even decide to postpone projects altogether. As a group, renters might be households that cannot afford to buy, cannot qualify for a home mortgage or simply choose to rent by lifestyle choice. In high-rent markets, finding housing is difficult enough for many of them, as they sometimes pay over 50 percent of annual income on housing alone. As such, many renters fall into the category of severely cost-burdened households according to the Department of Housing and Urban Developments’ (HUD) rule which uses a maximum of 30 percent of annual income to determine if housing is affordable, which is not realistic in supply constrained markets. Collectively, these households ultimately suffer when additional impediments to supply are added to their list of challenges. The increased risk weight for banks as it relates to high volatility commercial real estate (HVCRE) went into effect at the beginning of this year. The result is that all acquisition, development and construction (ADC) CRE loans must be reported separately from other CRE loans and are to be assigned a risk weighting of 150% for risk-based capital purposes – above the typical requirement of 100%. This will have a significant impact on banks’ capital ratios and ability to lend at historic pricing levels. It is important to note that these restrictions are related to real estate, specifically construction, and not the macro-economy. The HVCRE requirements are changing the way lenders reserve for construction lending and impacting availability and pricing, including becoming more conservative in terms of leverage or asking for partial recourse. Lenders are more focused on leverage and execution. Many lenders are now topping out at 60% LTC for construction, with a heavy focus on pre-leasing. Other lenders are also pulling back on specific property types – like hospitality, spec office, retail – and have decided to pause construction loans altogether, unless the deal is highly compelling or a repeat borrower. We have arrived at an inflection point in which lenders are becoming more sensitive to construction and more focused on clean deals to avoid scrutiny by internal credit committee and regulators. In this edition of Capital Insights, we dive into what is causing the choppiness in the CMBS markets, and alternatives where borrowers are heading to refinance pending loan maturities. As well, we consider how these events could affect the capital markets in the second half of 2016. CMBS issuances year-to-date as of February 12th have been a paltry $6.5 billion, compared to $13.7 billion for the same time period in 2015. Given the robust (or at least steady) flow of positive national economic employment and spending figures, we ask – why are CMBS originators pumping the brakes? Unlike the last cycle in which lax underwriting precipitated the initial slowdown in the CMBS market, in this case there are various external factors that are making it hard for CMBS lenders to price new loans competitively and commit to terms prior to closing. First, the number of CMBS lenders has shrunk. As spreads continued to widen through Q4 2015, various players missed their break-evens in the December 2015 securitizations, and were pushed out of the market. The insight from our recent survey of CMBS lenders is that the market will “barbell” as mid-sized origination shops are squeezed out by large originators that are securitizing on a frequent basis, and niche lenders that are bound to specific product types or geographies. The focus is now on execution, after a volatile Q4 in which the spread on benchmark CMBS paper blew out, squeezing profits and causing higher spreads on new loans. Second, CMBS bond buyers are still finding their feet in the New Year. Spreads for the “rated” tranches of the recent CMBS securitizations are being pushed wider as these bond buyers look to the relative value of widened spreads on corporate bonds and demanded the same (or higher) returns from CMBS bonds. Had this just been typical “noise” in the market, CMBS spreads would have pinched back in or stabilized at a wider spread, but in this case the pending regulatory requirements (set to take effect in December 2016) for the “unrated” B-Piece of the CMBS securitizations is leading to a greater uncertainty in nascent business model of CMBS 2.0, as CMBS originators and private funds reconfigure the capital used for B-Piece purchases. The new regulations will require CMBS originators to keep a stake in their originations and hold the risk on their balance sheets for 5 years in an attempt to discourage risky lending and keep their “skin in the game”. As a result, CMBS originators are treading cautiously – pricing loans with enough “cushion” and regressing to primary markets. Subtle innovations include a “spread lock” mechanism for large loan borrowers, as well as, lenders raising capital to acquire their own “unrated” B-Piece tranches in separate vehicles. Borrowers who would traditionally look to a CMBS refinance are looking elsewhere, as re-trades on pricing and terms in the turmoil of year end have now readjusted their expectations on leverage and focus on certainty of execution. Dekel Capital recently conducted a comprehensive survey of the banks, debt funds, and life companies that are soaking up the pending loan maturities that one year ago would have gone to CMBS. Market sentiment is positive as debt funds are seeing more business as borrowers look for better execution and/or 36 months of runway to decide to either sell the product or place fixed rate pricing on it. Additionally, there are life companies with products pushing leverage to 70% LTV. These newer products can rate lock at application and are priced competitively against CMBS pricing. Market input is that the 2016 lending capacity for debt funds, life companies, and banks may be deployed by later summer, leading to a potential liquidity crunch should deals come up against a pending loan maturity. The equity groups we speak with on a regular basis have echoed this sentiment, modeling their own exit scenarios and are shifting away from investing in vacant office conversions or retail repositions involving a significant period of downtime, with the focus in-place cash flow. Dekel Capital has identified a Life Company with ample capital to deploy for long-term fixed rate loans. The loan program can push leverage to 70% LTV, fixed or floating rate terms are available at competitive pricing. If you have a pending transaction in need of financing, contact a member of the Dekel Capital executive team to discuss how we can assist in finding the best capital source for your needs. In the first few weeks of 2016, we have seen the stock market retreat due to global economic and geopolitical uncertainty. This uncertainty has promoted a flight to safety that, in turn, has caused treasury yields to drop 28 basis points since the start of the year. While the drop in treasuries is generally a good thing for real estate capital markets, investors and developers, it has had a profound impact on CMBS lenders who have not seen this kind of rate volatility in quite some time. In this month’s publication we discuss how construction lenders, CMBS originators and B-Piece buyers are adjusting to the volatility in the bond market and the pending implementation of new regulation, as well as the federal banking agencies’ hawkeyed statement for risk management in commercial real estate lending. Dekel Capital recently conducted a comprehensive survey of construction lenders. Market sentiment is positive and the expectation is for another busy year. Market volatility in the past six months is recognized but market specific growth drivers remain robust and new projects are being underwritten to trended market rent and absorption levels. The national banks, regional banks, and debt funds that fueled the boom in construction and heavy value-add projects through the end of 2015 have not lost momentum, maintaining a strong appetite for construction lending with a focus on residential, creative office, and hospitality projects. With an eye on adjusting exposure among product types, lender feedback in the new year indicates a desire to deploy more capital into student housing and senior housing, as well as, for retail – assuming strong preleasing in place prior to breaking ground. 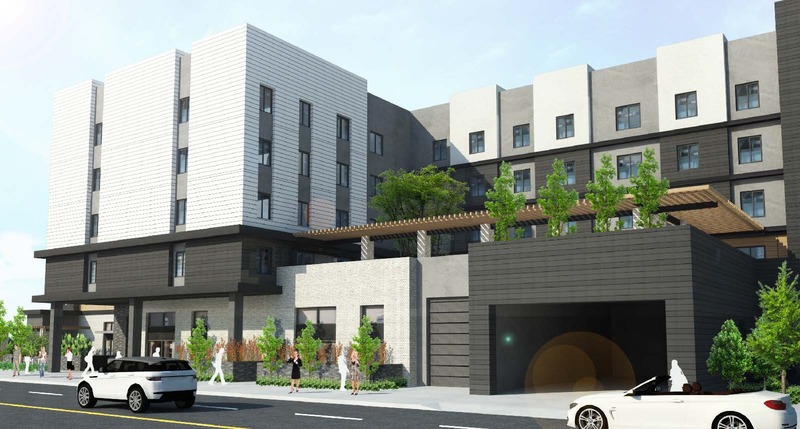 Specifically, one regional lender has indicated they have a new allocation of $100M of non-recourse construction financing for new student housing developments. Recourse lenders are maintaining their sizing parameter at 75% of project cost, with non-recourse lenders coming in slightly tighter. Bridge lenders are also seeing increased activity as borrowers with maturing CMBS loans are looking for alternatives in the short term. Bridge funds are well capitalized and have the capacity to lend across all product types at competitive floating rate pricing. The continued volatility of the bond market has affected borrowers and places pressure on originators that have to hold loans on their books for any protracted period of time – 30 days or more. This has been a distinct advantage for the larger originators as they are frequently out to market faster than the smaller origination groups. Yesterday, the 10-year treasury fell below 2% for the second time this month, a drop of 28 basis points since the start of the year and its lowest level since October 2014. The sharp decline was matched by increases in AAA spreads as investors in the top rated tranches hit their yield floors thereby causing CMBS spreads to widen accordingly, and many CMBS lenders to adjust their quoted spreads in applications. This spread adjustment has hurt borrowers in process with CMBS loans who would usually benefit from declining treasury rates. While 2015 proved to be a difficult year for a number of CMBS originators, CMBS is still a great option for high leverage, long-term, non-recourse and cheap debt. However, considering the recent volatility and new regulatory pressures impact on originators profitability, we expect there to be some consolidation in the number of CMBS lenders in 2016. The risk-retention regulations, part of the Dodd-Frank financial regulations that ensure B-piece buyers hold B-pieces for at least five years, amongst other things, are set to take effect in December 2016. As this date approaches, many buyers and investors are gaining a clearer idea of how the regulations impact them, specifically the five-year hold mandate after purchasing the bottom five percent of a securitization. Investors usually retain the unrated notes and single B-class for their high yields and fee-rich, special-servicing rights and look to sell single some B-notes and low-yielding B-class to infuse fresh capital for new purchases. However, the regulations stipulate that B-pieces must be sold intact, unless two-thirds of the collateral balance has been retired which can be more than five years due to limited amortization in conduit deals and loan extensions. This results in B-piece buyers retaining the bonds for the life of the loan or more and in some cases, lock up a B-piece buyer’s investment for more than a decade. As we get closer to the regulation start date, we may see B-piece buyers changing to a long-term hold strategy and setting up strategic long-term funds. As 2015 concluded, federal banking agencies issued a joint statement cautioning the commercial real estate industry and explaining how they will be proactively monitoring financial institutions using risk management practices. The decision came as a result of the agencies’ increased suspicion that CRE’s recent lending growth might not be sustainable long term. The market, driven by historically low cap rates and rising property values, has surged and banks have been lowering underwriting standards to keep up with competition. The new, prudent risk management practices may slow down CRE lending in 2016 as banks begin to tighten standards under the pressure of federal agencies’ supervision. However, this close monitoring of banks will give non-regulated lenders a prime opportunity to increase their volume throughout the new year. Regulatory changes and market movements have dominated the news cycle for capital markets this month, so we’ve outlined the top items you need to know for what lies ahead in 2016. The U.S. economy entered a new era this week with the Fed’s decision to increase short-term interest rates for the first time in nearly a decade. This move did not come as a surprise to the market. After months of deliberation and allusions to a possible hike by members of the Fed, capital markets have already priced in the new 0.25%-to-0.5% rate increase. In their statement Wednesday, the Fed left the door open for further rate increases next year as the economic indicators continue to strengthen, and the economy reaches the 2% inflation target. In its rational to initiate an increase, the Fed cited that the low interest rate environment has met its intended goal to stimulate the economy. The allure of the low interest rate environment in particular drove an influx of capital into the market from both foreign and national investors seeking to capitalize on the increasingly healthier US economy. Capital providers looking to fund investments flooded major gateway cities and primary markets, which resulted in investor focus and financing options shifting to secondary markets. The economic drivers in secondary markets have remained at healthy levels, along with strong jobs data and employment growth, giving lenders more comfort and resulting in a strong lending outlook for the upcoming year. The conduit lenders and agencies each hit a minor roadblock in 2015. Conduit spreads widened significantly over the summer, driven by fluctuations in the Chinese stock market as well as an abundance of issuance. Agency lenders surprised the market early in the second-quarter of 2015 by curtailing lending and widening spreads due to lending capacity limits, with some exceptions for affordable and smaller properties. How the wall of CMBS maturities will impact the market remains one of the biggest question marks for capital markets moving into 2016. We can see from the chart below that CMBS issuance saw positive year-over-year growth from Q1-Q3 2014 to the same periods in 2015; however, the market is holding its breath for the wall of CMBS maturities coming down the pipeline, unsure of its impact. Coupled with risk retention requirements beginning in 2016, this may impact the positive momentum built in the last few years and restrict the amount of capital available. Considering all of this, 2016 is shaping up to be an environment framed by an increasingly constrained flow of capital and higher interest rates – albeit minor compared to the zero rate climate we’ve grown accustomed to for the past seven years. Increased regulatory stipulations will most likely affect leverage and pricing for traditional commercial real estate financing, and may push borrowers to less-regulated sources of capital to fill the gap. An uptick in interest rates could translate into lower cash returns for investors acquiring commercial properties; however, since a hike signals an improving economy, investors may be able to make up the difference with higher rental rates in a market that could support such an increase. In 2015, we saw a continued low interest rate environment, the implementation of Basel III regulations and a multitude of new entrants to the market in all areas of the capital stack. Looking ahead at 2016, we will see additional constraints put into place on capital flows. These increased regulatory stipulations and constraints on capital will effect leverage and pricing for commercial real estate and have borrowers seeking non-regulated sources of capital to fill the gap. As required by the Dodd-Frank Act, the final credit risk retention regulations for asset-backed securities (ABS) is set to be implemented in 2016. This may limit the amount of capital that is available as well as increase the cost of CMBS capital, if it is implemented as written. Groups will have to shift their perspective and investor base to attract longer-term capital due to the five-year hold mandate. The regulations essentially require a securitizer of ABS to hold 5% of the credit risk of any asset collateralized by issuance for a minimum of five years from the closing date of securitization. On the positive side, well-capitalized funds are being set up to take on the additional risk. While that will help with the availability of capital, it will ultimately have a negative impact on spreads. In October 2015, the FHFA maintained Fannie & Freddie’s lending cap at $30 billion each in 2016; the same amount as 2015. However, a new quarterly review will be instituted to ease concerns over possible cap breaches and allow for potential adjustments, given current market conditions. In addition to the exclusions added in 2015 to prioritize affordable housing, low-income apartments in rural areas, senior housing loans, small multifamily properties targeting low-income tenants and energy efficiency improvements will also be excluded in the year to come. In April of 2015, Fannie and Freddie widened spreads and tightened underwriting in an effort to slow down their lending programs, which were on track to exceed their annual limit of $30 billion by the third quarter of 2015. If by year end, the agencies have reached their cap and a deal does not meet the list of exclusions, companies with balance sheet capabilities could have a distinct advantage by providing financing and holding the loan on book until the cap is refreshed in 2017. The EB-5 visa, a method of obtaining a green card for foreign nationals that invest money in the U.S., was created in 1990 with the intent to bring investments that would in turn create jobs in the U.S. However, the program began receiving more attention as a result of the financial crash. Critics say the visa program is poorly regulated, susceptible to fraud and provides an unfair “fast pass” to citizenship for the wealthy. Over the years, some developers have even benefited from this alternative and cheap source of capital by bending provisions meant for rural or high-unemployment areas. The program was originally set to expire on Sept. 30, 2015, but was extended until Dec. 11, 2015 when Congress will vote on further legislation for the program. California Senator Diane Feinstein, who recently voiced her disapproval for the program and stated it “puts a price on citizenship,” will likely use this opportunity to call on Congress to end the program. The EB-5 visa program has grown over 700% from $321 million in 2008 to $2.56 billion in 2014, and is expected to generate $4.4 billion in foreign direct investments for 2015. In 2014, a total of 10,692 EB-5 visas were issued, with 85% of those allotted to Chinese investors. To some, this could be a wakeup call to steer away from programs that rely on government programs and regulation for real estate funding. The quality of capital seems to be increasingly constrained by regulatory stipulations. Banks are constrained by regulations, the agencies have been capped and risk retention requirements on CMBS may create an artificial cap on CMBS lending. Naturally, a portion of the mortgages have been paid off through defeasance due to low rates but the wall of CMBS maturities is coming and many are concerned with what volume can be met by these highly constrained capital sources. From this, we may see more non-regulated finance companies stepping into the lending space as the banks and CMBS shops that provide over 50% of capital on an annual basis are having their capital limited. With holiday decorations popping up around town, we are reminded that year-end is just around the corner. While many traditional lending sources – banks, life companies and agencies – have their hands full, active private money lenders are well-capitalized and can fund your year-end acquisition opportunities. These lenders are hungry to meet their own lending goals and have quick-close capabilities to fund deals in as little as two weeks. Dekel Capital has identified a high leverage balance sheet lender that can execute your next financing by year-end. For the past several months, the commercial real estate industry has been awaiting the decision that would impact not only its bottom line, but also its momentum towards a stronger recovery. While labor markets have strengthened, downward pricing pressure from the decline in oil and commodities has kept inflation below the Federal Reserve’s target. In fact, the Fed took the path of least resistance and voted to keep interest rates at 0.25 percent as inflation remains below the two percent mark. At the press conference following the Fed’s decision, Federal Reserve Chairwoman Janet Yellen echoed Stanley Fischer’s thoughts during the Jackson Hole Summit last month. Fischer explained that unemployment is not what’s slowing inflation. The lagging inflation is rather a product of a drop in oil and commodity prices, and a rise in the dollar. The strength of the dollar allows for cheaper imports but impedes exports. The Fed offered no insight in a recent press release as to the timing of the rate increase but will do so “when it has seen some further improvement in the labor market and is reasonably confident that inflation will move back to its 2 percent objective over the medium term,” according to the issued statement. The 16-1 vote against raising rates today was the first time since January that Fed members were not unanimous in their voting. The decision will be tabled until their next meeting, where projections show 13 policy makers seeing higher rates by the year end. Based on the forecast, we are likely to see only one increase in October or December, down from two in the previous forecast. 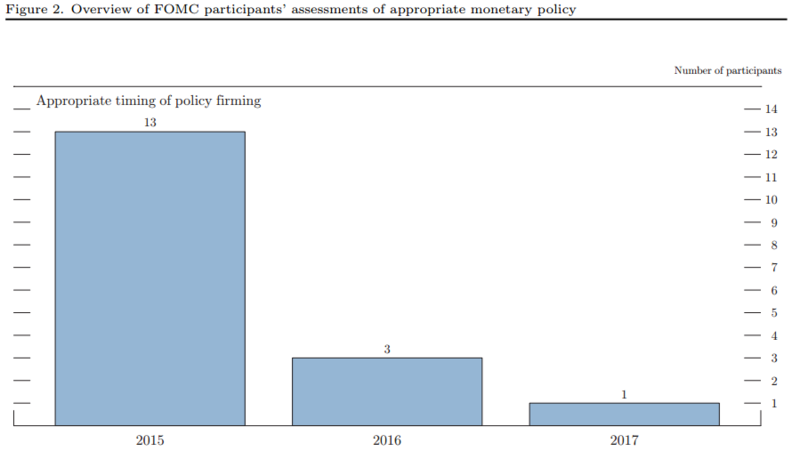 The graph below was released in September and shows when FOMC participants find it appropriate to raise interest rates. 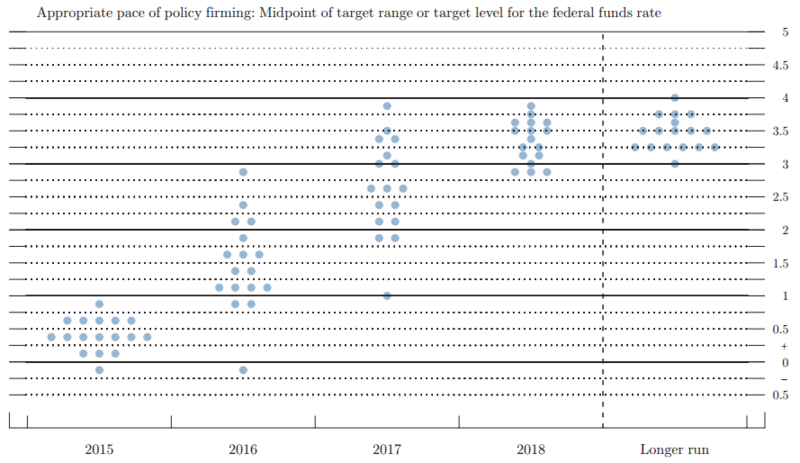 The Dot Plot below was released in September and shows where FOMC participants predict the federal funds rate to be. It is important to note that the dot plot is a tool that provides insight as to how the committee members felt at the September meeting. What does this mean for commercial real estate? The Fed’s decision brings stability and continuation of low interest rates for construction, bridge, and floating rate loans. Additionally, the pressure on bank earnings net interest margin should encourage lenders to increase real estate lending. While at the Western States CREF Conference in Las Vegas, Dekel Capital saw an increase in new capital providers seeking to gain a toehold among the already competitive field of CMBS Lenders, Bridge Debt Funds, and Bank Lenders. Non-recourse bridge lending on both cash flowing and non-cash flowing value-add plays is aggressively pricing in the high 4 percent’s to low 6 percent’s across all product types, at up to 80 percent of project costs. The market for non-recourse construction lending is also becoming more fluid at leverage up to 60 percent – 65 percent, as new players enter the space. The new “new money” at CREF was mezzanine debt at up to 85 percent LTV behind CMBS and Agency financing, fully co-terminus with the first TD. This mezz debt prices in the low double digits. Lastly, banks are also expanding their lending programs, offering fixed rate loans that serve as lower cost options to CMBS and Agency debt, in some cases with more flexible pre-pay structures. In April of this year, GE exited the banking business by spinning off GE Capital, the higher risk $500 billion finance business that was 42 percent of company profit last year. The company has already sold $26.5 billion worth of office and CRE debt to Blackstone Group LP, Wells Fargo, and other investors, and is expected to fully divest as early as 2016. Part of the $9 billion portfolio Wells Fargo purchased from GE Capital included loans for manufactured homes and communities, a space dominated by Wells Fargo ($7 billion in loans since 2004) and GE Capital ($6.2 billion loans since 2004). Now, as the clear leader in manufactured home lending, Wells Fargo plans to expand the division and has recently hired Matt Krasinksi and Lew Grace, two GE Capital veterans, to lead the charge. Other lenders have been working towards capturing the $10 billion GE was originating per year of both bridge and permanent loans. Also in April, Fannie Mae and Freddie Mac slowed down their multifamily lending program because both government sponsored enterprises were on track to exceed their annual limit of $30 billion each by Q3 2015. The annual lending caps, which only apply to market rate apartment loans, were established in 2013 by the Federal Housing Finance Agency to encourage more private capital in the market. 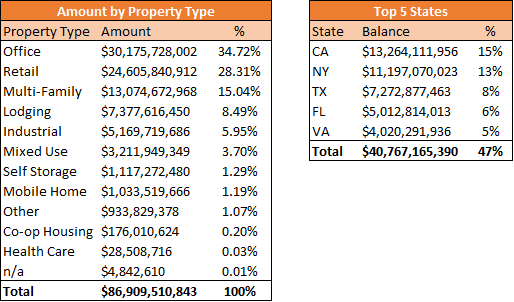 Fannie Mae issued $10.4 billion in Q1 and $14.5 billion during Q2 in multifamily mortgage-backed securities, while Freddie Mac’s multifamily lending volume hit $10 billion for Q1 and $13.1 billion for Q2. This high production volume has been driven by low interest rates, large loan sizes and overall higher demand for apartments as well as deferred business from the end of 2014. Fannie and Freddie slowed down process by tightening their underwriting and increasing spreads. Currently their focus is on “affordable housing” and properties under 100 units, both of which are excluded from the cap. BASEL III is a global bank framework that proposes further banking regulation on capital adequacy, stress testing and market liquidity risk. Basel III was created in an effort to repair the financial crash and restore a proper financial system. It forces banks to hold substantially more capital, or shrink their footprint, which reduces the effect they would have on the financial system if they were to fail. The overall significance of Basel III is that with banks improving their capital ratios, there will be less liquidity in our global capital system. Because of this, smaller or weaker banks might find it difficult to raise capital, which could ultimately result in banks exiting the market place, merging or being acquired. High Volatility Commercial Real Estate: Under Basel III, regulators created this new category which applies to acquisition, development and construction loans requiring higher capital reserves. This is making these loans more expensive for banks to fund. Furthermore, the new rules require a 15 percent minimum cash equity requirement to avoid a High Volatility designation, as well as max 80 percent LTV on the finished product. Specifically, the appreciated value of the land does not count towards the equity requirement, only the cash paid for the land or the original basis. The recent free-fall of the Chinese financial markets created some of the worst volatility in our capital markets since 2009. This market volatility has scared investors, which resulted in a flight to safety, causing the 10-year treasury to drop below 2% for the first time since April of this year, compressing the treasury yield 20 basis points in the past week. The global economic slowdown will cause the Federal Reserve unanticipated aggravation leading up to their September 17th meeting. In light of this, the overwhelming market expectations that the Fed would start raising rates in September is becoming more of a 50/50 proposition. 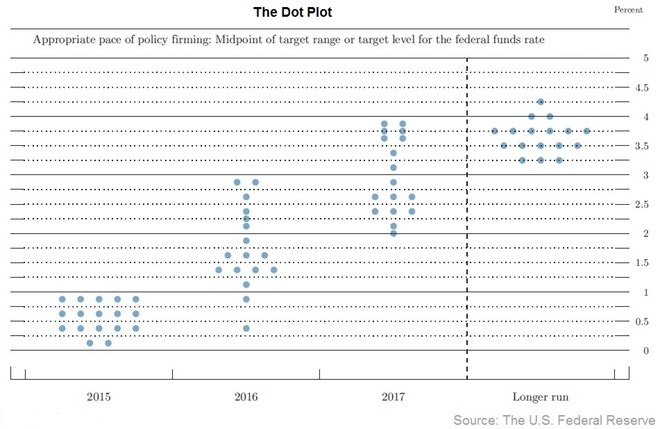 The Dot Plot below was released in June and shows where each Fed member predicted federal funds rate to be. It is important to note that the plot is not official, but rather a tool that provides insight as to how the committee members felt at their June meeting. New lending sources have entered the market to fill the gap as both banks and agencies face the lending hurdles described above. “Stretch senior” lending programs provide bridge loans up to 75 percent to 80 percent of cost for value-add repositioning of existing assets. Specific groups with dry powder are focused on medical office, creative office and multifamily. Mezzanine and Preferred Equity providers are showing an appetite in coming in behind these bridge lenders and pushing leverage up to 90 percent of cost. In a bid-to-win business, these mezzanine and preferred equity groups are lowering their minimum amount to $1 million in some cases. Lastly, various bank lenders are aiming to fill the capacity left by the agencies by offering attractive long-term, fixed rate, non-recourse loans. As we enter into the second half of 2015, it is important to note that there are disruptive market movements on the horizon. Clearly a change in interest rates will have a major impact, and with the regulatory environment in its current state, new lending sources will most likely continue to enter the market in order to bridge the gap left by banks and agencies. 2015 is shaping up to be an interesting year. We had a great time at the Bisnow Los Angeles Capital Markets Summit and enjoyed the Bridge & Mezz update moderated by our very own, Shlomi Ronen. 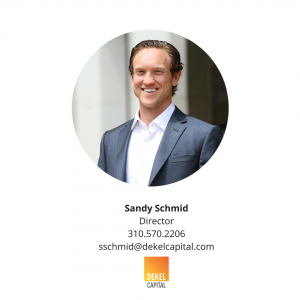 In January 2014 Dekel Capital launched Dekel Strategic Investors (DSI), a JV-equity platform to provide equity capital to real estate developers engaging in multifamily, senior housing, student housing, and retail development projects. Over the past 18 months, the DSI has invested over $65 million across nine projects throughout the United States. DSI will continue to fill the recognized gap in the capital markets for equity investment between $3 and $10 million and is targeting a total of $100 million of JV-equity investment by year end. Max Friedman, SVP at Dekel Capital, was quoted in PrivcapRE’s article Mezz Debt’s Steady Advance in Risk by Christopher O’Dea on March 2, 2015.
commercial private equity real estate and complex financing structures. In recent months Dekel Capital has been actively arranging high-leverage loans and financing structures (up to 90% LTC, non-recourse) for clients acquiring value-add and core-plus deals nationwide. We’d like to use this opportunity to share with you some of the market intelligence we’ve gathered. This financing can be sourced wholly from a single source, debt fund underwriting to a CLO execution, or by placing a senior loan plus mezz/pref equity. These capital sources are focused on business plan execution across all property types and are not constrained by bank leverage metrics, enabling them to fund loans to higher LTC’s. In one recent assignment, Dekel Capital sourced 90% LTC non-recourse financing (Freddie Floating Rate Loan + Pref Equity) at a sub-6.0% blended rate, non-recourse and fixed for 5 years, for the acquisition of a 300-unit value-add multifamily deal on an underperforming class-B multifamily asset in Southern Florida. Furthermore, we recently spoke to a new fund that is focused deploying preferred equity or mezz debt (up to 90% LTC) for the acquisition of core-plus (8-11% leveraged IRR) projects in major metropolitan markets. This program is well suited for underperforming properties with either near term lease roll, above market vacancy, significant deferred maintenance, or repositioning. This capital is highly motivated to fund urban/in-fill retail acquisitions. If you are working on a transaction that would benefit from these types of financings please to contact us for a confidential discussion. commercial real estate assets nationally. 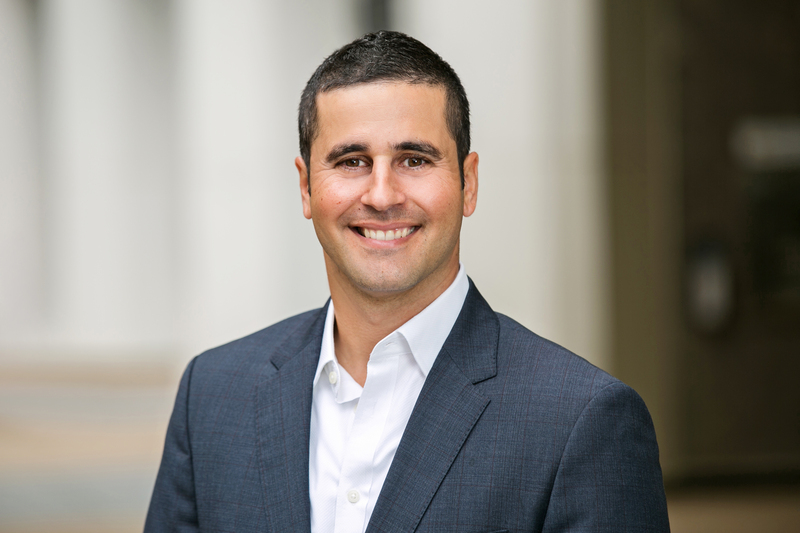 Friedman joins Dekel Capital after two-and-a-half years with Boston Private Bank and Trust Company. 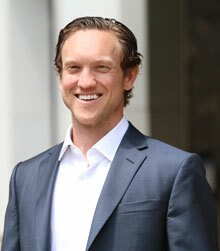 As Vice President in the Los Angeles office, Friedman originated commercial real estate loans for bank clients and was also responsible for managing a portfolio of Southern California commercial loans. 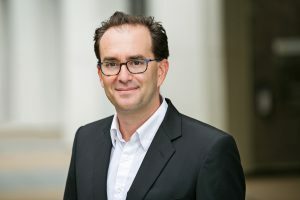 Previously, Friedman was an Assistant Vice President at Los Angeles-based commercial real estate firm George Smith Partners, where he worked on structured finance assignments and loan sales. Friedman started his career as an Analyst in the Equity Derivatives department at Goldman Sachs in New York. Friedman completed, with honors, his undergraduate studies at Tufts University and holds an MBA degree from IESE Business School in Barcelona, Spain and an MIA from the School of International and Public Affairs at Columbia University in the City of New York. Los Angeles – Dekel Capital, a Los Angeles-based real estate investment banking firm, has arranged an $17 million of permanent debt on behalf of Orange County, CA-based Core Capital Investments for a cash-out refinance of a coastal mobile home park set on approximately 15 acres located in Southern California, announced Dekel Managing Principal Shlomi Ronen. Many condominium developers who rode out the real-estate downturn by renting out their units are reverting to for-sale housing, in another sign of the market’s continued recovery over the past year. Take Amir Haber, a Los Angeles developer who opened his Universal Lofts project at precisely the wrong moment in late 2008, when the stock market was in free fall and home prices were declining at a double-digit pace. Instead of selling off the project’s 67 lofts that range from 2,000 to 2,500 square feet and sit across the highway from Universal Studios, Mr. Haber converted them into high-end rentals that range from about $3,800 to $5,500 a month. Universal Lofts in Studio City is one of the apartment complexes to turn to the once popular practice of converting to condos. The trend is far below peak in 2007. Apartment building owners in Los Angeles and throughout California are once again converting to condos, but not at the torrid pace of 2007, when condo conversion peaked before the Great Recession. The work-live units at Universal Lofts in Studio City, across the 101 Freeway from Universal Studios, were built in 2008 as condominiums. But with the 2007-09 recession underway, developers turned them into apartments. Now the owners are back with plans for condos.